A beautiful new home for arts presenting and community cultural events in the heart of Telluride, Colorado. The Warehouse is a game changer for the arts in Telluride, providing a platform for high-caliber, thought-provoking works, activating dialogue, expanding access to the arts for all ages, and strengthening Telluride’s connection with culture and ideas across the globe. The Warehouse will elevate the quality of life in Telluride by providing powerful new programming that brings people together for transformative cultural experiences. With four floors of thoughtfully planned multidisciplinary art spaces, it will function as a lively center for the arts and community events. Telluride will always have legendary mountains, boundless outdoor recreation, and preserved open space. The Warehouse will be the cultural equivalent to these natural assets. It will be a treasured cultural, architectural, and historic landmark at the nexus of this special place. Visionary, soulful, and deeply local, the Transfer Warehouse will provide a profound point of connection between local and global, past and future, old and new. The historic stone walls will remain exposed. The fluidity between outside and in reinforces our mountain lifestyle. The main floor will draw people in from South Fir Street into an open, two-story, indoor-outdoor atrium complete with a bar/café, a grand piano, café and lounge seating, space for pop-up exhibits. Tha main floor has the most flexible space that will be ideal for small scale exhibits by featured local and visiting artists, a shop, concierge, and compact offices for the Telluride Arts District. A contemporary, wooden, ark-like structure will be built inside of the existing walls. Underground a fixed-seat theatre will provide a comfortable environment to view film, hear lectures, and hear interviews and tiny concerts for broadcast. Between the new interior timber volume and the historic stone walls is the main circulation stairway, which features exposed stone walls that are flooded with natural light from above. At the top level a roof top bar and an open deck creates social and event spaces while taking in the panoramic view of the box canyon. The project respects the existing stone walls by inserting a new multi-story wood volume within them to create a climate-controlled space for exhibitions. Stone and wood respect the building’s heritage, but we also are introducing the latest, most sustainable materials, state-of-the-art timber technology to provide warmth and character throughout. The large space between the old stone walls and the new timber volume is the great hall: the perfect place for gatherings and events. The new structure will feature an open and flexible lobby, complete with place for coffee and tea next to the museum shop and offices. The main gallery is on the second floor. The large, flexible space will accommodate a diversity of art forms. On top is the roof bar and an open deck, designed to give the public a spectacular place to build community, while taking in the panoramic view of the box canyon. Between the new timber volume and the historic stone walls is the main circulation stairway, which connects the performance and film space in the lower level with the top floor. Overall, the project aims to amplify the future of Telluride by cultivating a dynamic relationship to its past and supporting its present, evolving needs. The Telluride Transfer Warehouse is quintessential Telluride: historic, intimate, high caliber. The Transfer Warehouse will bring energy, attention, and excitement to the arts and artists in Telluride. The main floor is the most flexible space, designed to welcome people to explore the building and events therein by capturing the natural intrigue of passerby for the landmark structure. On this level, there is ample space for community events, receptions, small concerts and innovative performances, poetry readings, a small shop and culture concierge, and pop-up studio/exhibits for local artists who will be featured on a monthly, or part time basis. The Transfer Warehouse will be a GEM for the arts in Telluride. The second floor is a large exhibitions space, designed to accommodate major museum quality, content-driven, curated exhibits made possible for the first time in the region. In the shoulder seasons, the space can be transformed into a spectacular artist-in-residence studio, providing a launchpad for both local and visiting artists to develop new work in a truly inspired setting. The gallery is designed to accommodate both traditional and new works, sculpture, digital, immersive… and have the flexibility to allow artists to have the creative freedom they require. THE WAREHOUSE WILL BRING A NEW, FINELY TUNED MEDIA SPACE TO TELLURIDE. On the basement level, a 100-seat media room will provide a highly tuned environment to view film, join as a live audience for programs broadcast by Telluride TV and KOTO in a “Studio B” concept, and take some of the pressure off of the over-booked nearby Program Room at the Wilkinson Public Library. The space is being designed to serve the Telluride Film Festival and Mountainfilm, lectures by TSRC and others, and will support new media exhibitions, art films, and more. THE ROOFTOP BAR WILL BE A SPECTACULAR place for gatherings set within a panoramic view of the box canyon. The Telluride Transfer Warehouse will function as a true community cultural center, with four separate and distinct spaces that can be utilized at the same time. The bar features a signature program space for the building, The Table, that provides a place for people to gather for meetings, meals, artist conversations, or just sit with a coffee and a good book. The rooftop bar is modeled off of other museum-style cafes, and will be open to the public most days, and also available for private events. The Warehouse will be a game changer for the arts in Telluride. the warehouse is designed to be FREE AND open to the public on a daily basis, welcoming a flow of people who want to explore the historic landmark, and the powerful exhibitions and cultural events inside. A 4,000 SF gallery space on the second floor will put Telluride on the map for high powered art installations and exhibitions produced in partnership with galleries, local and visiting artists, museums, academic and arts institutions both locally and nationally. This exciting new space is unlike anything in the region, and will drive other programs throughout the space, including artist lectures, community discussions, docent tours for all ages, films, classes, and other content-driven programming. The main gallery is envisioned to be transformed into artist-in-residence studio in the shoulder seasons, serving both local and visiting artists with spectacular space to develop new work. In addition to the gallery, smaller, flexible space called Gallery/Studios will serve as temporary, pop-up, innovative space to promote featured artists. The Warehouse will have events that are open to the public daily. On the main floor live acoustic music centered around the grand piano in the great hall, local and visiting artists’ pop up shops, plays, poetry readings, piano concerts, and temporary studios on the main floor. The underground ‘media room’ will be programmed with films, lectures, new media exhibits, and live studio broadcasts. On the gallery level, exhibitions and installations will be enhanced by artist talks and docent tours. On the rooftop level, community conversations, meals, and meetings will be held at the Table. The deck can be used for small exhibitions and acoustic music events that complement artist reception, poetry events, etc. Some programming will be produced in collaboration with other institutions and foundations. There are two places in the building, on the main floor and the rooftop bar, that will provide food and beverage to create an inviting atmosphere that draws people into the building for quieter, focused cultural activities. The building has been designed to serve the needs of the community with high caliber spaces that elevate arts and culture, and can be rented to provide operating income to subsidize the numerous free cultural activities provided to the public. Four separate events can happen in the building at one time, some free, some ticketed, some public, some private. This model provides reliable income to that ensure financial stability and low cost and free accessibility for artists and arts organizations. So, we ask a lot of questions and do a lot of planning. Boring, but important. Since 2011 our community attended 50 + meetings to develop a vision and long-term goals for the arts in Telluride that were captured in the Telluride Cultural Master Plan (update), two Three-Year Workplans, the ArtSpace Sustainable Facilities Analysis, the Arts District Marketing Plan, the Telluride Wayfinding Plan, and others. To develop a vision and game plan for the Warehouse, our community came out for 20 + planning meetings. The boards of P&Z, HARC, and the Town Council have worked tirelessly and listened to community input to finalizing a PUD that would make the Warehouse a public space for our community, forever. Have something to add? Please email us at info@telluridearts.org, come find us at HQ, call us, or full out our survey linked at the top of the page. Telluride Arts is the chosen local non-profit organization who will lead the restoration and redevelopment of the Telluride Transfer Warehouse. The goal of Telluride Arts is to advance Telluride as a center for both local and visiting extraordinary artists who infuse our authentic mountain community with world-class ideas. Our mission uniquely qualifies Telluride Arts to develop the Transfer Warehouse into a permanent home for the arts in Telluride. We view the development of the Transfer Warehouse as an essential project to preserve what we love best about Telluride and evolve with the growing community. Telluride Arts is a 501(c)3 non-profit organization that was established on November 17, 1971. The organization was the first non-profit in the region, and served to incubate a culture of the arts that has come to define Telluride. Our programs elevate and promote a culture of the arts in the Telluride Arts District, one of the first Certified Creative Districts in Colorado. As the manager of the Telluride Arts District, Telluride Arts has proven its ability to connect, galvanize, and strategically advance the arts as a whole. Restoration and adaptive reuse of the Warehouse will strengthen both the Telluride National Historic Landmark District and the Telluride Arts District. The Telluride Transfer Warehouse will be beautiful space in the heart of downtown Telluride, and an anchor for the Telluride Arts District. The Warehouse has been planned in the context of existing arts institutions, so as not to compete, but to complement and and enhance the arts. The spaces will alleviate some of the pressure on the Wilkinson Public Library and will be synergistic with the new Town of Telluride building under construction now, that will include underground public parking, affordable housing units, and the new Ah Haa School for the Arts. The adaptive reuse of the Telluride Transfer Warehouse will forward the Telluride Master Plan to create a vibrant community center in the Four Corners region of town. The Warehouse will forward the Telluride Cultural Master Plan priority to secure expanded and improved spaces for the arts which is so essential to the vibrancy of our cultural life in Telluride. The Telluride Transfer Warehouse project is an extraordinary opportunity to preserve an iconic historic landmark and provide space that matches the caliber of arts and cultural events that will continue to flourish in, and define, Telluride. The Telluride Arts District follows the boundaries of the Town of Telluride, and contains a remarkable concentration of arts and cultural activity that engages artists from around the region and across the globe. Artists and the arts have helped create the Telluride that we all love--brimming with interesting exhibits and events that leave lasting impressions on our lives. The Telluride Cultural Master Plan revealed a demonstrated need for increased and expanded space for the arts in the District. The Telluride Transfer Warehouse will enable the cultural life in Telluride to flourish in pace with the growth of the town. It will be a world-class space for high-caliber arts and cultural events, and will serve to maintain the cultural vibrancy that distinguishes Telluride from other mountain towns. The Telluride Transfer Warehouse is eligible for inclusion in the National Register of Historic Places, and in the State Register of Historic Properties. It is also a strongly contributing resource located within the Telluride National Historic Landmark District. "Built in 1906, the Telluride Transfer Company Warehouse is an imposing, two-story, sandstone structure located at the southwest corner of Pacific Avenue and Fir Street in Telluride, Colorado. The building served as the livery barn, warehouse, and office for the Telluride Transfer Company until the 1950s, and has been allowed to slowly deteriorate since that time. The building remained in use as commercial storage and as a filling station until 1978. Its roof collapsed in the spring of 1979. The Schuler Family bought the building and surrounding properties from Bill Nardin, and owned them for many years before selling it to Joe Zoline in 1968. Bucky Schuler and his father Babe Schuler ran a hauling company, a garage, a dealership, and gas station in the Warehouse. Cars were stored on the second story that was accessed by a wooden ramp. Bucky and his wife Pat are known for being humble and generous community members who owned numerous businesses around town. Joe Zoline, the visionary founder of the Telluride Ski Area, purchased the property on the SW corner of Fir and Pacific Street from the Telluride Transfer Company in 1968. 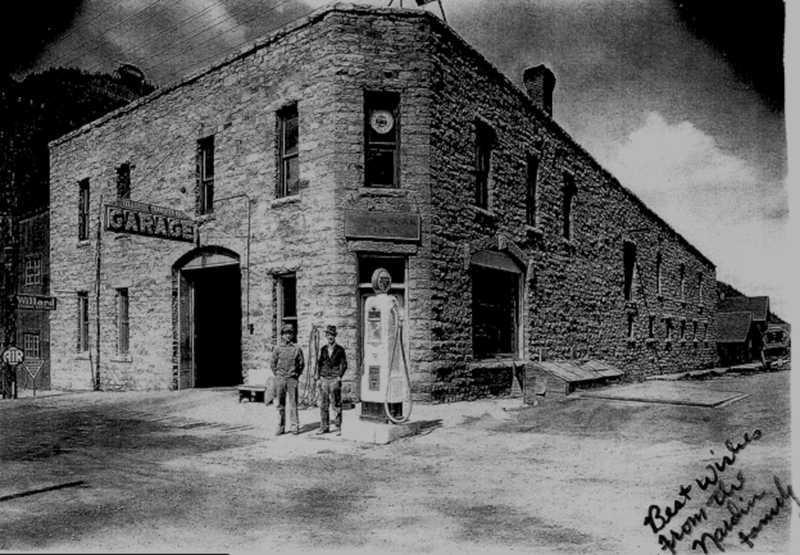 He continued use of the Transfer Warehouse as downtown gas station and storage facility until 1978. In the spring of 1979 the roof collapsed from a heavy snow load; it was the first winter the building had not been heated. Since that time Joe’s daughter and son in law, Pamela and John Lifton-Zoline, and Joe’s son Thomas, have been thoughtful stewards of the building, bracing and protecting the walls for 34 years.